I enjoyed this movie. 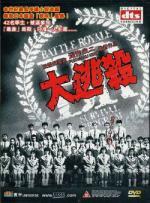 This movie is about 42 students who are left on an island and must kill each other until only one is left, otherwise all are killed after three days time. I think the movie is well done. My favorite is the teacher who put them all there. My favorite scene is the briefing of the students of what they have to face. And yet another movie where one of Death Note's cast has a role. "Light" from Death Note has also a starring role here. Glad you enjoyed it, Tom. Now... take heed if you want an untarnished memory of this film... no matter how tempted you are, do not consider the sequel. Ever. It's an insult to intelligence. Yes, it is actually the first time, that I am not even tempted to buy a sequel to a movie I liked. Glad you liked it too. Yes, Takeshi Kitano/Beat Takeshi is interesting to watch in this film, although not necessarily my favorite. After having watched the movie I have gone through the cast list and noticed, that someone was in Kill Bill. But I wouldn't have recognized her, as even now I do not remember who Gogo is (only seen Kill Bill Vol 1 twice and Vol 2 once so far). Had to look it up on Wikipedia. Two Girls with the same name but from very different upbringings, one dreaming of stardom and the other in pursuit of personal fulfillment, take on new challenges as they seek to mature in their personal and professional lives. Despite diametrically opposed personalities, both find in each other a mutual "complementarity" that fuels each other's dreams of happiness and success. But life never stands still, and when reality steps in with challenges that begin eroding the foundations of their friendship, the two Nanas find themselves clinging to a promise they made to see a summer fireworks display together as a symbol of hope that their destinies are still tied. Watchable sequel but far from the first movie. And of what I have read, whereas the first movie was praised by fans of the manga whereas this sequel was a major disappointment for them. Seji "Mad Dog" Sawamura is the ultimate high-school punk. With his super-strong, invincible right hand, he can punch through cenemt walls and lay waste to entire street gangs. But street cred comes with a high price - every girl in the school is absolutely terrified of him! Just when he thinks he is doomed to fly solo forever, Seji's right hand becomes an actual girl! Midori Kasugano wished she could be by Seiji's side...but ended up somehow attached to his wrist. Seiji's fighting days may be over, but his girl-trouble days are about to begin!! Great fun series! Have it seen three times so far, and it never gets boring. Jon Heder ('Napoleon Dynamite') and Billy Bob Thornton ('Bad Santa') face off in this "devilishly funny comedy" (Jeffrey Lyons, NBC's 'Reel Talk') by writer/director Todd Phillips ('Old School', 'Starsky & Hutch'). When unlucky loser Roger (Heder) takes a confidence-building class taught by an egomaniacal teacher (Thornton), the two are pitted in an outrageous battle to determine the ultimate guy's guy. When the rivalry spirals uproariously out of control, no prank is too extreme, no insult is over the line, and nothing is off limits. Featuring Michael Clarke Duncan, Sarah Silverman, David Cross, Jacinda Barrett and Ben Stiller, 'School For Scoundrels' is "uncontrollably hilarious... Billy Bob Thornton and Jon Heder are at the top of their game" (Pete Hammond, 'Maxim'). Against my expectation, I liked this movie very much. As a matter of fact, I liked it so much, that I will probably check out the original 1960 movie of which this movie was remake of. Tim Rice and Andrew Lloyd Webber's Jesus Christ Superstar first exploded onto the the west end stage in 1971 and it was clear that the musical world would never be the same again. For the first time ever, Jesus Christ Superstar has been specially filmed for video. Shot at Pinewood studios. This brand new filmed stage version starring Glenn Carter and Jerome Pradon captures one of the best scores Andrew Lloyd Webber has ever written and is packed with hit songs including "I Don't Know How to Love Him", "Gethsemane" and "Superstar". 'Jesus Christ Superstar' is one of my all-time favorite musicals. And this stage adaption I like very much. I think it's better than the '70s movie version. This version together with the original 1970 recording are my favorite versions of the musical. I especially like the way Jerome Pradon plays Judas. He is not the perfect singer (even his own admission), but I like how he conveys the feelings of someone having to betray one of his dearest friends and his regret doing so. It's tough to keep your grades up without having to take off at a moment's notice to save the world. But for Sousuke Sagara, undercover high school student and member of the mercenary group Mithril, life in Tokyo seemed the same as always. But underneath the promising exterior spin the wheels of a conspiracy that threaten to destroy the peace. A new threat has arisen: Amalgam. An unknown element with advanced mech technology, this mysterious organization has been running things from behind the scenes. As dissension spreads throughout the ranks of Mithril, Sousuke faces his own internal struggle. Spread thin between schoolwork and war, the powers that be have decided to lighten his load... beginning with Kaname! Life and death hang in the balance as the clash between good and evil scale new heights. When the smoke clears, Sousuke's path will be the one that he forges for himself. 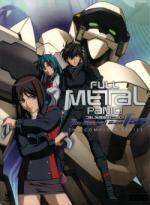 The third installment in the Full Metal Panic series. And what an emotional roller coaster ride! Whereas the first series mixes a serious story-arc with light fun episodes, this series is mostly drama. Essentially a 180 to the previous (second) series FUMOFFU which was fun-only. Also the extras on this DVD set a quite fun. A 7-part featurette where the original author and the series director are going location scouting in Hong Kong. Although it gets rather boring with the video footage, the two provide fun commentary to it, which seldomly has anything to do with the video footage. Then we have audio commentaries for all episodes with the Japanese voice cast. Again, there are mostly talking about everything except about the episodes . But I enjoyed them nonetheless. The best extra feature of course is the bonus episode centering around the Tessa character. Originally it was released in Japan on DVD-only one year after The Second Raid series. This episode is comedy pure! It is Sasahara's first day of college and a fateful choice awaits him: which college clubs will he chose to join? But Sasahara is no ordinary young man - a dark secret lurks within his soul. For one thing, he knows what "cosplay" is, how to unlock all the secret characters in "Guilty Gear X," what the plot twist is in episode twenty-five of "Kujibiki Unbalance" because he's read the manga, he's heard of doujinshi, and he needs to know more. Enter Genshiken, the barely legitimized Society for the Study of Modern Visual Culture, home to all subspecies of Otaku! Now Otaku can watch this complete series from the safety of their own basements!! Contains all 12 episodes of Genshiken plus 3 episodes of Kubijiki Unbalance. Great adaption of the first few volumes of the manga. I also like the music from the opener. Cannot wait to see further episodes (3 OVAs and a second season already exists) which will introduce my favorite character from the manga. As a bonus there are three full episodes of the fictional anime series the characters in Genshiken like to watch. Kumiko Yamaguchi is the heir to the Oedo Yakuza family, but it's her dream to teach the youth of Japan. Putting aside her Yakuza cunning, she takes up the role of a normal bubbly graduate, landing a high-school teaching job. Now Kumiko is determined to understand the teenage mind, teach higher math and maybe carry on a little romance... yet she lives with the fact that her loyal army of brutal hitmen capable of murdering disobedient students are only one step away. Yesterday, after having received this series, I wrote, that I only bought it, because it was cheap. It seemed like a series, which could be interesting but had a high chance to totally miss my taste (after watching the opener below before buying it seemed to make this impression to me). I was wrong! It was 12 bucks very well spent! Now only one day later I have already watched all 13 episodes almost in one sitting. This series is about a young female rookie teacher who starts in a school full of rowdy high schoolers. What nobody knows, she is actually part of a feared Yakuza (Japanese mafia) family and she is one of the best fighters there is. But she has to hide this side of herself at school to not get fired as a teacher, which is her life's dream. The problem is, her students always seem to get in some kind of trouble. Thanks Tom for the reviews! This is one of the reasons I like this site best; I get to learn about movies I wouldn't normally hear about. Sadly I haven't watched many movies for awhile. My unwatched pile is again growing bigger.